Josh Eichorn: Has pictures of Princess Diana that he’s willing to let go for a damn fair price considering what he went through to get them. President Clinton finally gets to meet one of his greatest idols in the form of SuperPatriot as he welcomes him and the rest of the newly formed Special Operations Strikeforce to the White House. It is pointed out to him that it is Dragon that is running the team, not SuperPatriot. Hawkins attempts to introduce Dragon to Clinton but he is not interested, preferring to witness the President getting verbally abused by SuperPatriot over the actions of the government to Third World nations. Hawkins grows frustrated with Dragon but is cheered up when Barbaric expressed a huge interest in being marketed as a celebrity. Barbaric is enthusiastic about being a brand name just like the members of Youngblood were, despite Dragon’s adamant stance against such actions. He also notes that the extra money would really help when Ricochet and he have their unborn child. Hawkins is horrified by the prospect of trying to market two youngsters with a child born out of wedlock and advises him to get married before Ricochet’s bump starts to show. At the S.O.S. compound, an angry Rapture confronts Dragon over the inclusion of Jennifer Murphy within the team. She accuses her ex-boyfriend of recruiting her solely to upset her but this theory is rejected outright. Dragon points out that they are no longer together and he can do anything he desires but also Rapture and Smasher will not even be working together anytime soon as they are on completely different teams at the moment. Barbaric makes a desperate proposal of marriage to Ricochet and is relieved when she accepts. He then gives Hawkins a signal that their plan is in motion and they can now start preparing a toy deal. Barbaric goes to see Dragon and interrupts a training session between him and Smasher. He asks that Dragon be his best man and states that SuperPatriot is going to be giving Ricochet away at the altar. As he is getting his haircut changed to improve his image, Barbaric is confronted by Ricochet after she discovers the identities of some of the people he has invited to their wedding. A huge number of heroes have been invited as Barbaric wants to recreate other famous weddings between superheroes. It is pointed out that those events always ended in disaster and he agrees to rein it in, despite having taken out a full page advert in a newspaper for their ceremony. The day of the wedding finally arrives and Dragon joins Barbaric in welcoming the wedding guests which consist of all kinds of superheroes. Hellboy is amongst the crowd and he gets to talking with Dragon about government work, offering the chance for Dragon to move over to the B.P.R.D. so that he can avoid the spandex costume situation. As the ceremony is about to commence, a number of villains carry out an assault but the sheer number of heroes present causes it to be a fairly one-sided affair. Ricochet screams for the violence to end as it is ruining her special day and all of the combatants soon stand down. 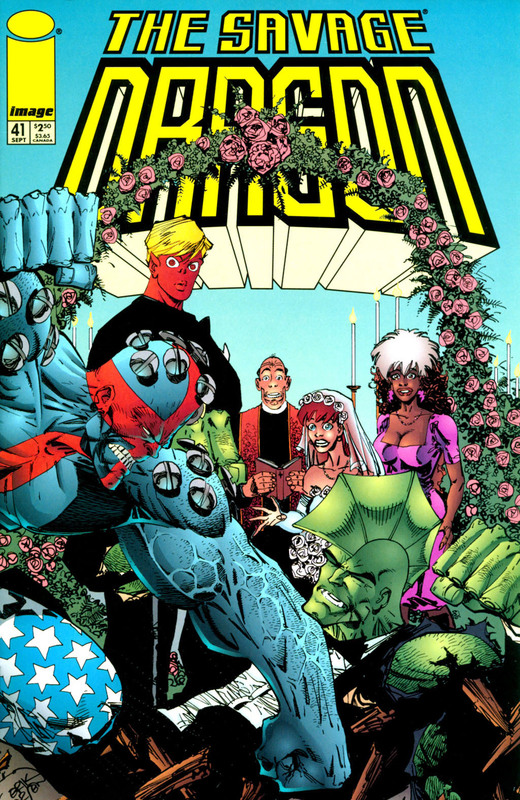 The priest finally gets to carry out the ceremony and Barbaric and Ricochet are soon married. Ricochet throws her flowers which are caught by Smasher before Barbaric removers her garter belt. As he and Ricochet tease with one another about their wedding night, the garter is thrown out towards the male guests. It ends up landing atop Dragon’s fin, something that hardly amuses him.